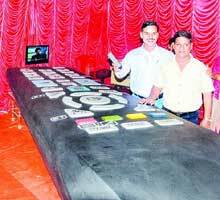 Two Odia brothers of Sambalpur in Odisha made largest TV remote and entered into the Guinness Book of World Records. Rajesh Meher, 42, and his younger brother, Suraj Meher, 39, of Dhanupali have made this television (TV) remote control that’s touted as the largest in the world. Odisha Chief Minister Naveen Patnaik felicitated two brothers at the State Secretariat recently. The remote control is 4.5m long, 1.8m wide and 0.72m high. There are 37 keys in the remote control and is 23.68 times larger than a regular one. Interestingly, neither of the brothers has any technical background or education. While Rajesh has a furniture shop in the city, Suraj runs a stationery shop. He said it took them 68 days to make the TV remote control which works on their LCD TV. The brothers have spent around Rs 50,000 to make the remote, all with the aim to get into the record book. “My brother has already found a place in the Limca Records for making the smallest fan. That recognition inspired us and we decided to make an attempt to make an entry into the Guinness Records,” said Rajesh. “I had to sell my bike to arrange money for making the largest remote control. But I am happy as we succeeded in making it. We worked for 4 to 5 hours daily to make the remote control,” said Suraj. Although the two brothers had initially planned to invite the authorities of Guinness Book of World Records to Sambalpur, financial implication forced them to send the video and photographs besides news clippings to claim their place in Guinness Record. Suraj Meher and his brother Rajesh got place in the Guinness Book of World Record on September 21 this year. They hail from Sambalpur town’s Dhanupali-based Meher Colony.